Google Earth for iOS received an update to version 7.0 on Thursday, adding 3D imagery for key cities around the world as well as a new "tour guide" mode to encourage exploration right in your own backyard. Although Android users have been flying across the world on their smartphones and tablets since the end of June, the iOS update is noteworthy for beating Apple to the punch by several months. 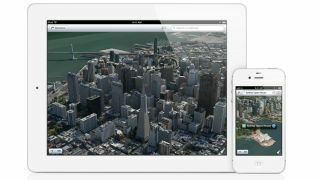 With Google being shown the door and no longer part of the built-in iOS Maps app beginning with the fall release of iOS 6, the search company has to find new ways to keep its products in the hands of iPhone, iPod touch and iPad users. Google Earth 7.0 is only a taste of what's to come - 3D images are only available for a handful of cities, including Los Angeles, Boston, San Francisco, Geneva and Rome, but new additions are promised in the weeks ahead. A new "tour guide" mode also allows users to "explore places you never thought to search for," featuring guided tours of your favorite cities, historic landmarks and even natural wonders. Curiously, Google appears to be focusing its efforts primarily on mobile for now, but promises an update that will bring the new 3D maps to its desktop software before the end of the year.